The Randall Research Awards luncheon honors winners. 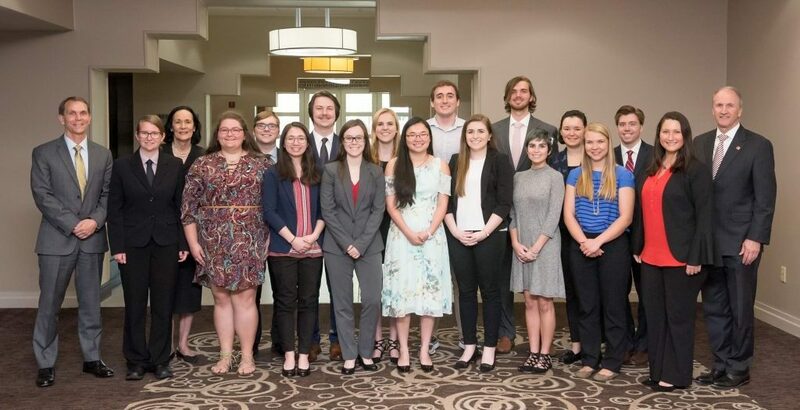 The Randall Outstanding Undergraduate Research Award Program recognizes and celebrates the best research activity conducted by undergraduate students at The University of Alabama. Undergraduate students who have conducted significant scholarly research are nominated by faculty/staff research directors. The recipients and their nominators are recognized at a luncheon in their honor during UA’s Honors Week. In 1997, the Randall Publishing Co. and the H. Pettus Randall III family created the Randall Outstanding Undergraduate Research Award Program in memory of Henry Pettus Randall Jr., a distinguished UA alumnus and creator of Who’s Who Among Students in American Universities and Colleges. A distinguished panel of UA research faculty and past winners of the Burnum Distinguished Faculty Award select the winners. University of Alabama students continue to win prestigious national awards. Fifty-three UA students have been named Goldwater Scholars, including two in 2018. The University of Alabama has produced a total of 15 Rhodes Scholars, 16 Truman Scholars, 33 Hollings Scholars and 13 Boren Scholars.